« BRAND NEW Richmond AVANTI Apartments by Polygon near Canada SkyTrain Line, Shopping/Dining & Entertainment! North Shore condo living at its best! The most anticipated new community coming soon to Central Lonsdale in North Vancouver! CentreView North Vancouver condos are brought to you by Onni Developers, one of our most favourite local builders who have decades of premier building experience. Live at the heart of it all! The North Van CentreView condos in Central Lonsdale will start from an affordable price point in the low $300’s only! This spring 2014, Onni will unveil the newest and largest mixed use North Shore community! At the gateway to Central Lonsdale CentreView North Vancouver condos will present amazing fist class amenities with over 90,000 square feet of retail space. Here, you will find a premier full service grocery store, coffee shop, restaurant and more just steps from your front door. CentreView North Vancouver condos will consist of 2 high-rise condo towers the showcase superbly finished and appointed 1 and 2 bedroom residences with unparalleled modern interior design features and breathtaking views to the water and North Shore mountains. You can register your interest for Centre View North Vancouver today at www.onni.com. The North Vancouver CentreView Wellness Centre will create a healthy and fun experience for all home owners. With over 10,000 square feet of on-site resort inspired amenities for you to enjoy, the CentreView Wellness Centre will include a landscaped roof top terrace with amazing views, an outdoor pool and hot tub and BBQ areas for summer entertainment. In addition, the North Vancouver CentreView Wellness Centre will feature a children’s playground and two professionally designed and furnished guest suites for overnighters. In addition, there is a games room, meeting room/media room and a large party clubhouse lounge with kitchen area. Also, Onni’s North Vancouver CentreView amenities will also include a squash court and a professionally equipped fitness centre. There are separate men’s and women’s change rooms and a sauna and steam room on site too! CentreView Welcomes Whole Foods in North Vancouver! From the latest CentreView newsletter update: We are excited to announce that CentreView in Central Lonsdale will be the future home of the North Vancouver Whole Foods Market! The 40,000 square foot organic and natural grocer will anchor the Central Lonsdale North Vancouver CentreView development, with doors expected to open early 2018. “We’re looking forward to becoming a part of the vibrant North Vancouver community,” said Joe Rogoff, President of Whole Foods Market in the Pacific Northwest Region. CentreView North Shore condos will be the new landmark destination in Central Lonsdale, offering over 90,000 square feet of prime retail space with extensive underground parking, more than 80,000 square feet of office space and a childcare facility. In addition to the North Vancouver Whole Foods Market, CentreView Condos in Central Lonsdale is expected to feature a national pharmacy, coffee shop, restaurant, and professional services. There will be approximately 340 homes in 2 towers that will be among the tallest in North Vancouver, offering spectacular views. The ground-breaking and truly innovative project at CentreView North Vancouver by Onni is a mix of residential, retail and office space at the heart of it all. Situated at 13th and Lonsdale North Vancouver, the Central Lonsdale CentreView condos will also include common public areas that are designed for more vibrant public spaces, maximize interaction and excitement in the community. The unique project will feature expansive views from the high-rise towers, a central location and a centrepiece for this newly revitalized urban hub on the North Shore. Imagine living minutes from everything, with all your shopping needs nearby, in the centre of one of the most coveted urban neighbourhoods in the Lower Mainland. At CentreView North Vancouver condos, you’ll have more than you could ever dream of for a fun, healthy and fulfilling life with five-star resort-inspired amenities on-site. This central and convenient Central Lonsdale North Vancouver real estate location is the new focal point of this community. Located at 13th Street and Lonsdale Avenue North Vancouver CentreView condos by Onni will be set amongst great shops and services, all within walking distance from your front door. This is also a retail destination with easy access to public transit to Upper and Lower Lonsdale, the Seabus, Lonsdale Quay and the local North Shore mountains. In addition, the Onni CentreView North Vancouver condos will be very close to Highway 1 and both the Lion’s Gate Bridge and Second Narrows Bridge. Within walking distance from CentreView North Vancouver Central Lonsdale condos is the City of North Vancouver City Hall, City Library, and many essential services, amenities, urban green spaces, parks, the waterfront and mountain trails. We are excited to announce that our Presentation Centre will be opening soon. 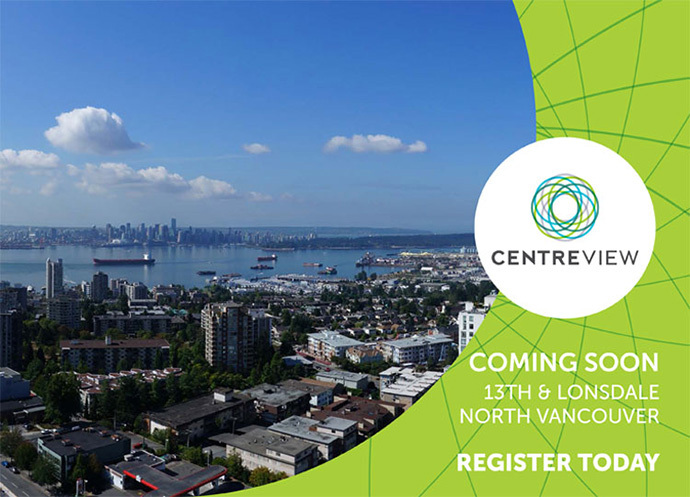 As a priority registrant you will have the first opportunity to own at CentreView, North Vancouver’s newest mixed-use community located at 13th and Lonsdale. With over 90,000 sq.ft. of new shops including a full-service grocery store, a pharmacy, a cafe and 80,000 sq.ft. of professional office space, this striking mixed-use development will serve as the gateway to a rejuvenated North Vancouver. CentreView North Vancouver condos in Central Lonsdale will raise the bar for interiors and amenities in Central Lonsdale. Homeowners will enjoy over 10,000 sq.ft. of indoor amenities at the CentreView Wellness Centre, which features a 3,000 sq.ft. professionally-equipped gym, an outdoor pool and hot tub, a squash court, games room, and a large party room with kitchen just to name a few. 1-2 bedroom Central Lonsdale CentreView North Van homes will be available starting from the low $300,000’s. Visit www.onni.com/centreview for more information.